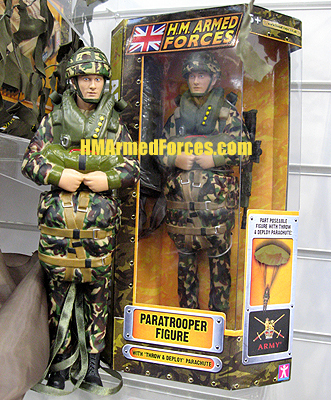 The HMAF Paratrooper Figure sees its first release in 2010 as part of the HM Armed Forces Army series. Following on from the successful 2009 release of the RAF Falcon Parachutist, The Army Paratrooper Figure is a similarly robust figure; strong enough to survive active service during the most arduous ‘throw and deploy’ parachute manoeuvres imaginable. This part posable HMAF Paratrooper Figure includes a fully operational parashoot with green canopy and fully moulded jungle combats and helmet.